School starts tomorrow and I think we’re ready (just). I was somewhat smug earlier in the summer as I had 90% of the kids uniform bought, I’d ordered name tags and was quickly gathering the remaining uniform we needed. Unfortunately my natural tendencies towards procrastination took over and, well, today I actually did the hard work. I’m currently nursing a mild repetitive strain injury from ironing labels onto two piles of uniform. That’s two hours of my life that I won’t be getting back and which I spent standing, moving an iron on and off of items of clothing, holding it 10-15 seconds at a time and repeating the action three times for each item. Perhaps I’ll go back to scribbling the kids’ names in biro on the labels – less resilient but much, much easier. Having actually labelled the clothes I then needed to put it away. This sounds like a simple task but, if you’d ever seen either of my big kids’ rooms you would know that this first required me to clear a path to wardrobes and chest of drawers and the chance of me standing on a small, painful piece of Lego was still guaranteed. At least I had enough hangers – always a positive to be found. I also found Lex’s PE bag (hidden under a pile of clothes in his wardrobe) and his recorder. The PE bag would have been easy to replace if it had stayed lost but since his plimsolls – the only size 12s we could find in town on the one day we had between him notifying us that his were too small and his next PE session – were hideously expensive (for plimsolls) and had. to. be. found. The recorder has been hidden all summer because I am a bad parent who thinks the sound of recorder practice is a form of parental torture. we went to try on shoes the week before school was due back and had enough time to order in the shoes the kids wanted (actual store selection was rubbish) and I ordered in the right alternative sizes (Tilly’s fit fine but Lex needed a half-size smaller than he was ‘measured’ as). Roll on the new school year and I promise next year to not leave everything to the day before (ha, ha). 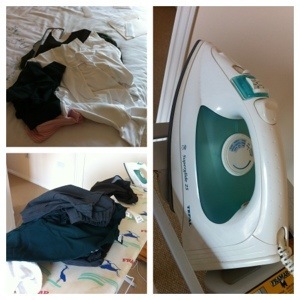 This entry was posted in Bits and bobs and tagged getting ready, organisation, school, uniform by twigletmac. Bookmark the permalink.